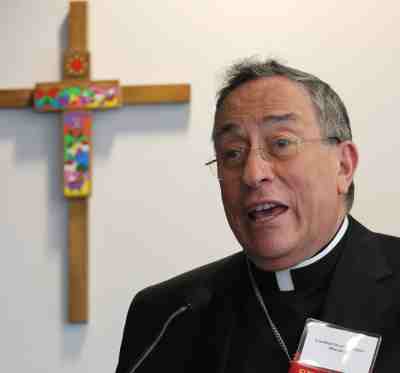 WASHINGTON (CNS) — The world financial system “has been built as a new idolatry,” charged Cardinal Oscar Rodriguez Maradiaga of Tegucigalpa, Honduras, at a June 3 forum in Washington sponsored by The Catholic University of America’s Institute for Policy Research & Catholic Studies. During his keynote address, Cardinal Rodriguez issued a ringing endorsement of the church’s competency to critique economic systems. The church knows about the economy because “we know about the human being,” the cardinal said. “The human being was not made for the economy, but the economy was made for the human being.” Pastors “smell like the sheep,” he added, borrowing a phrase from Pope Francis, and said libertarians and economists could benefit by being closer to the people. Cardinal Rodriguez was introduced by Richard Trumka, president of the AFL-CIO. Libertarian philosophy over federal budget discussions is “really distorting the debate,” said the Rev. David Beckmann, president of Bread for the World, the Christian citizens’ anti-hunger lobby whose headquarters, a few blocks from the Capitol, hosted the forum. Bread for the World is a member of the Circle of Protection, as is the U.S. Conference of Catholic Bishops. The “circle” is an alliance of faith-based organizations that has been pushing Congress this decade to spare the poor from the brunt of budget cuts. However, in the fiscal year 2015 budget proposed by the House Budget Committee chairman, Rep. Paul Ryan, R-Wis., programs benefiting low-income Americans would be on the receiving end of 69 percent of the budget cuts, according to an analysis by the Center for Budget and Policy Priorities. Ryan, a Catholic, had once been an ardent follower of libertarian philosopher and author Ayn Rand, although in 2012 he rejected Rand’s philosophy as atheistic. But Ryan has since come under criticism from some Catholic academics for misstating Catholic social teaching when issuing federal budget proposals. Libertarians argue for maximum individual autonomy and freedom of choice, emphasizing political freedom, voluntary association and the primacy of individual judgment. “Many of the libertarians do not read the social doctrine of the church,” he added, “but now they are trembling before the Book of Piketty,” a reference to French economist Thomas Piketty,” whose 700-page book, “Capital in the Twenty-First Century,” examining wealth inequality around the world, has become a surprise best-seller.